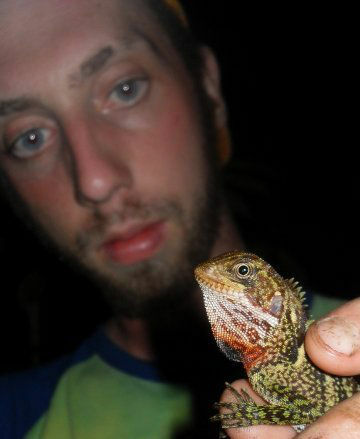 Andrew is a conservation biologist based out in the Peruvian Amazon. 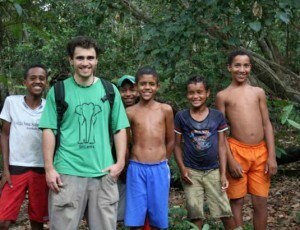 Here he tells us about his research in the Manu Biosphere reserve and offers advice for any young conservationists hoping to follow in his footsteps. Bio: I am a tropical field biologist originally from the North of England. 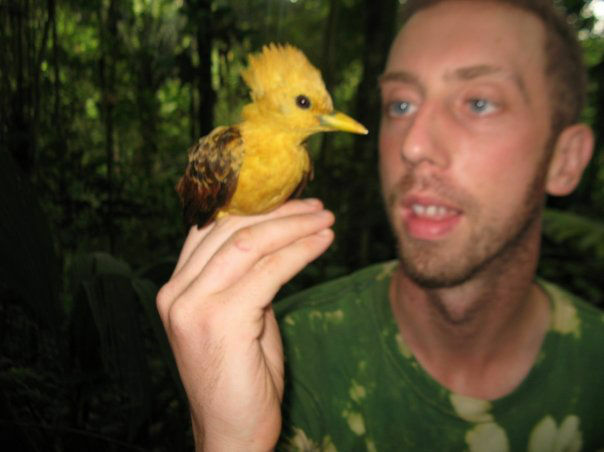 I first worked for two and a half years in Ecuadorian Rainforest, after traveling to Tanzania and Australia. I currently conduct my research on regenerating tropical forest and its potential for sustaining biodiversity. Can you tell us about your ‘office’? I work in south-eastern Peru in an area of the Manu Biosphere Reserve, one of the most acclaimed bio-diverse places on the planet. The journey runs from Cusco high up in the Andes and runs into the tropical forest lowlands. 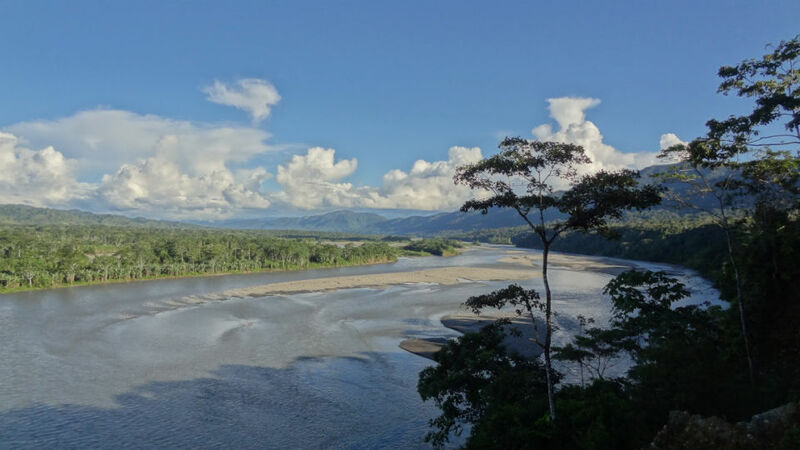 The majority of my field work is situated in the lowland rainforest, a hot and humid environment with regular temperature of 30ºC plus and humidity levels of over 90%. Occasionally we get hit with strange ‘friajes’, a cold front in which temperatures drop to 10ºC. My main field site, the Manu Learning Center (operated by crees for The crees Foundation) sits on the banks of the fast flowing waters of the upper Madre de Dios (Mother of God) river. An incredible site, with stunning views of the mountains in the distance to the west and lowland forest cover to the east. Tell us about the focus of your research in Manu. According to the Global Forest Resources Assessment (2010) primary forest only makes up around 36% of global forest cover whilst secondary/regenerating areas constitute 57%. My research studies the value of this regenerating forest, the majority of the world’s forest, in reference to its importance towards biodiversity and conservation. I actually work on a variety of animal groups. This includes amphibians, butterflies, birds, mammals, butterflies and reptiles. This multi-taxa assessment holds more weight in assessing the value of regenerating rainforest in terms of biodiversity and conservation value. The reserve provides a great patch of forest, which contains species of key conservation concern such as jaguar, black-faced spider monkey, blue-headed macaw and white-lipped peccary, amongst many others. This year I will focus on canopy dwelling species by climbing and placing traps 30+ meters up in the trees. There is so much in the canopy, but so little that we actually know. ABOVE: The view from the Manu Learning Center, Peru. "After 4 years of living and working in South-American rainforest, every week I still see something completely new that I have never seen before and that just makes the environment so exciting to me." Ever since first visiting Tanzania in 2007 I knew that tropical rainforest was for me. Seeing large mammals such as elephants from the back of a truck in the Serengeti was incredible, but nothing beats the thrill of being on foot in the forest and not knowing what might be around the next tree. After 4 years of living and working in South-American rainforest, every week I still see something completely new that I have never seen before and that just makes the environment so exciting to me. The diversity is truly incredible and I don’t think even within a lifetime you could see everything that exists there. That’s what makes this place so special, its unpredictable surprises and the challenge of discovering them. My field site at the Manu Learning Center is pretty comfortable for a field researcher too! 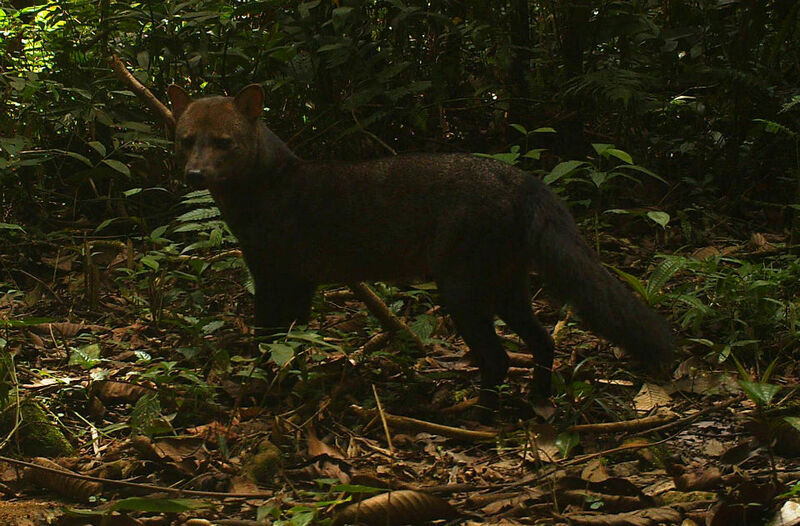 ABOVE: Camera trap image of a short-eared dog (Atelocynus microtis), also known as the short-eared zorro, is a unique and elusive canid species endemic to the Amazonian basin. This is the only species assigned to the genus Atelocynus. "Last year I managed to contract leishmaneisis and host a rather large hungry botfly larva, but the worst for me are the sweat bees." What are the highlights and challenges of working in the Amazon? The hardest aspect for many people is the challenge of finding animals and developing survey methods that are effective in a tropical rainforest environment. Equipment is expensive, budgets are tight and last year a group of leaf cutter ants destroyed two of my mist nets in a single night, a group of peccary smashed and trampled a camera trap and a jaguar decided to bite and destroy two camera traps, which was pretty tough to take. However, the nature of the challenge in that context strangely seems to appeal to me. I usually get used to the biting insects and mosquitoes pretty well. Last year I managed to contract leishmaneisis and host a rather large hungry botfly larva, but the worst for me are the sweat bees. When I am trying to climb or tree or work in a static position they can be intense. 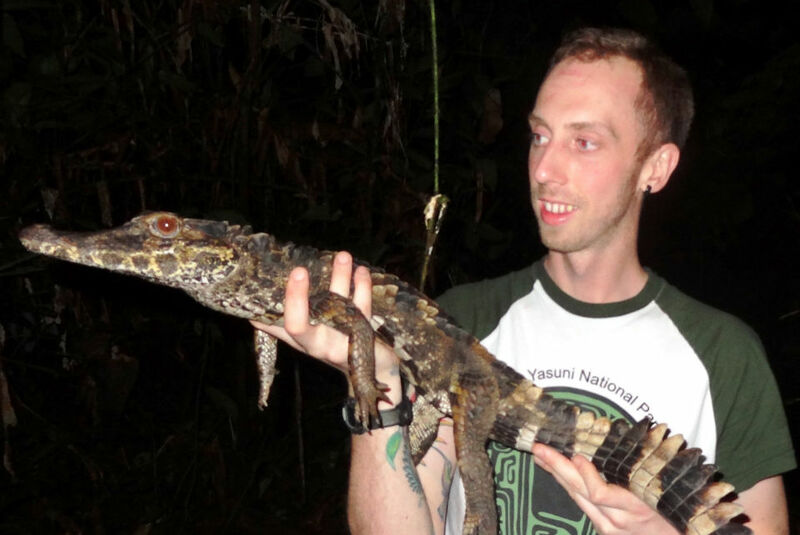 TOP LEFT: Andy with a spectacled caiman (Caiman crocodilus). TOP RIGHT: Andy with a bird caught in a mist net. 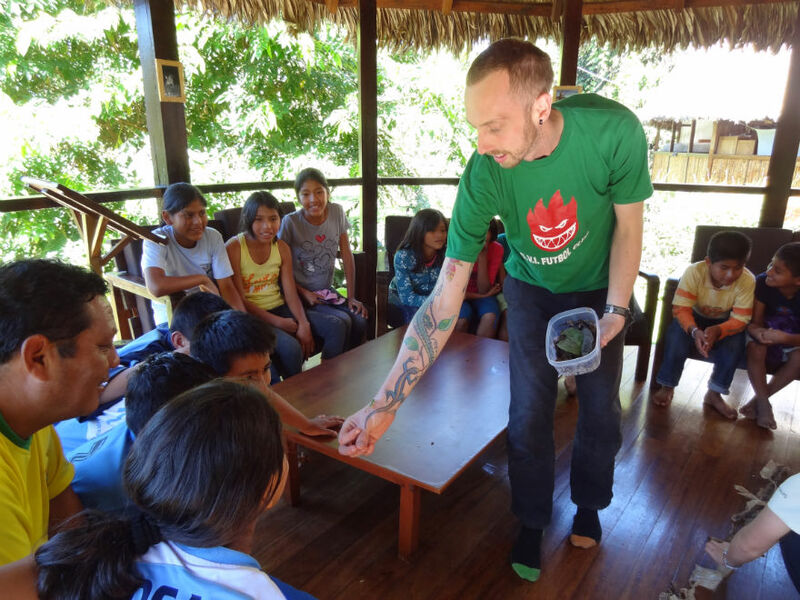 BOTTOM: Andy entertaining local children with frogs and snakes from the reserve. This research is funded and supported by The Crees Foundation and the University of Glasgow. All images copyright, and may not be reproduced without permission. If you could share 5 pieces of advice for research in this environment, what would they be? 1) Always take a working compass and GPS into the forest with you. Even on known trails, you might just run off to follow a group of Woolly Monkeys and find yourself disorientated and lost without them. 2) Wear long sleeved shirts for nocturnal research. The sand fly that carries leishmania specialises in transmitting this rather unwanted gift at night time. 3) Wellies or thick high set boots are best in South American forest, due to the rather notorious fer-de-lance viper and the bushmaster, the world’s longest viper. Beautiful snakes, but ambush predators that can often be sat close to the side of a trail. Certainly carry some anti-venom if you are working with these guys. 4) Look after equipment well with silica and dry bags. Humidity levels are devastatingly high and without good dry bags and dry boxes, equipment will quickly give in to forest humidity levels.